This job took 3 days to complete. Finishing touches need to be completed, such as testing and labeling jacks, making some of the excess wires at some of the jack locations neat, and drilling to the outside for 4 IP cameras. 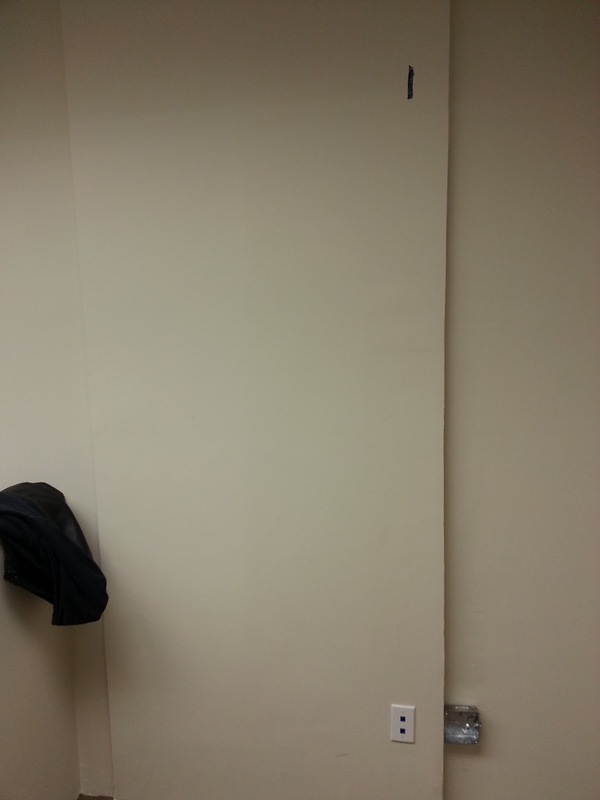 The wall where these panels are mounted on is a false wall. 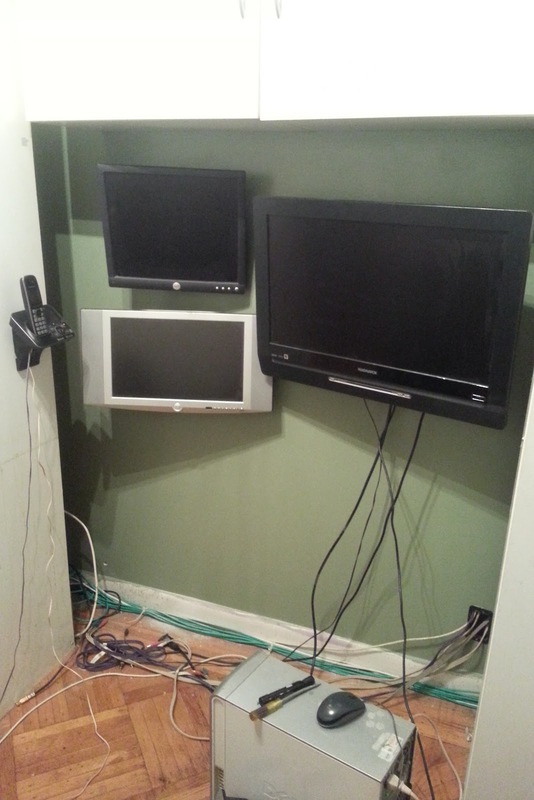 We were able to remove this wall to drill down to the basement to run the wiring. We then had to drill down underneath the registers to bring up a bunch of jacks (19 in total, 16 + 3 spares) We also had to drill down behind the Sheetrock to bring the wire up from the basement into the drop ceiling and run to several different locations inside the store. Patch panels completely punched down and mounted. The jacks for the exterior IP cameras that will be customer installed are located inside the drop ceiling. I did not want to drill the holes out and leave the wiring exposed to the elements until the cameras were mounted. Bringing the wire to the outside before exact camera placement can be determined would mean that the potential for exposed camera wiring exists. Leaving the wiring on the outside of the building with out being inside of a waterproof enclosure, such as the body of the camera also could lead to corrosion of the wire. Time permitting, additional photos of some of the jack locations and wire runs will be added after we return to complete testing and labeling of the jacks. 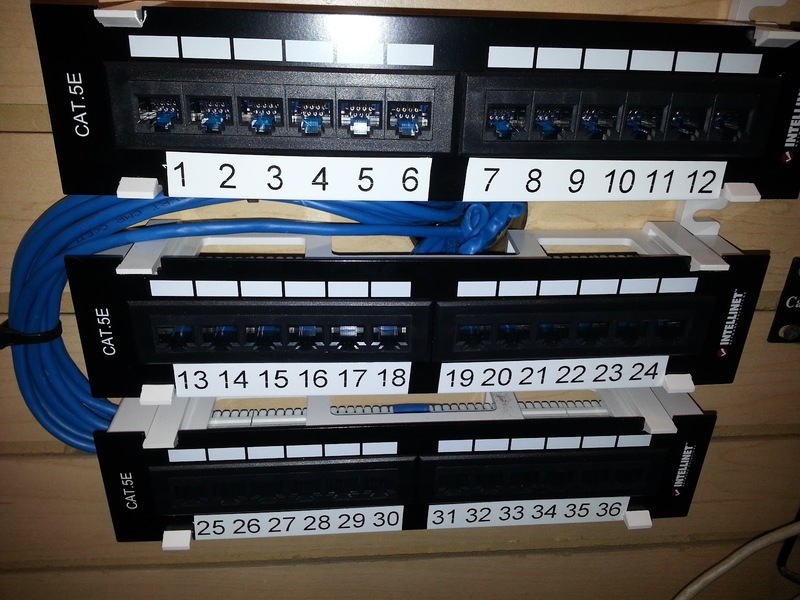 Finally started setting up patch panel for my home network. It has been some time since I ran the CAT6 cabling around my home. 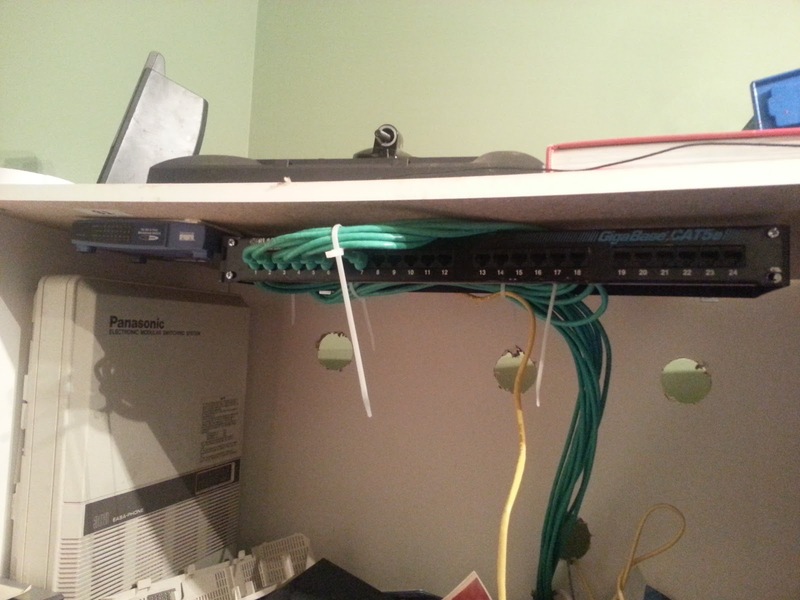 I used angle brackets to mount my 24 port CAT5e patch panel to the top of my network cabinet. 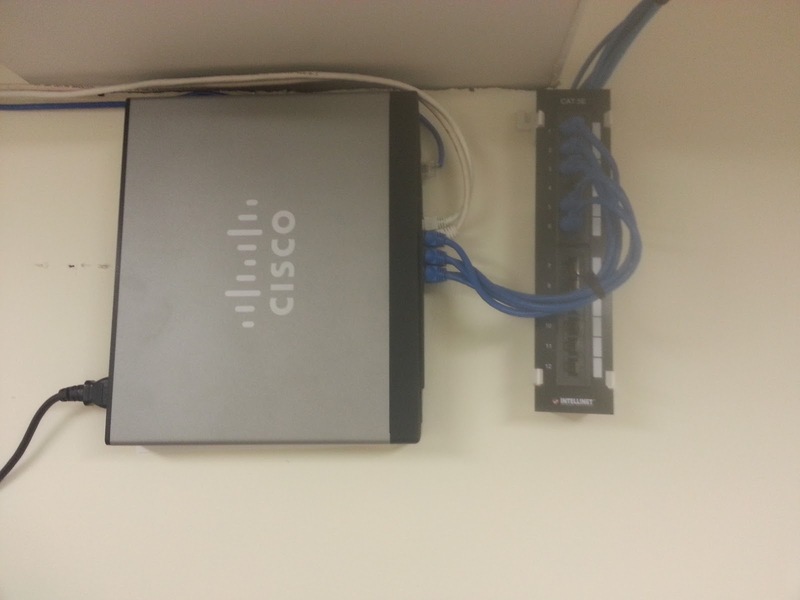 I used double sided tape to mount an 8 port switch (that will be eventually be replaced with a GB switch. 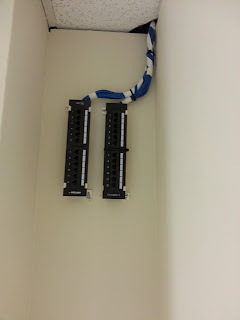 All CAT6 patch cords are used. I mounted my easa-phone 308 phone system to one side of the cabinet. More wiring and mounting of hardware needs to be completed, and the jacks still need to be terminated, labeled and CERTIFIED. Progress is not too bad, considering this is only getting done on weekends in between errands. So far the total cost for my LAN is at $0. Well that is a little deceptive, I did purchase the 8 port switch, but it was a few years ago. The CAT6 cabling, patch cords and panel, as well as the CAT6 inserts (that I need to install on the jack end of the wiring) was donated by my uncle when he retired. 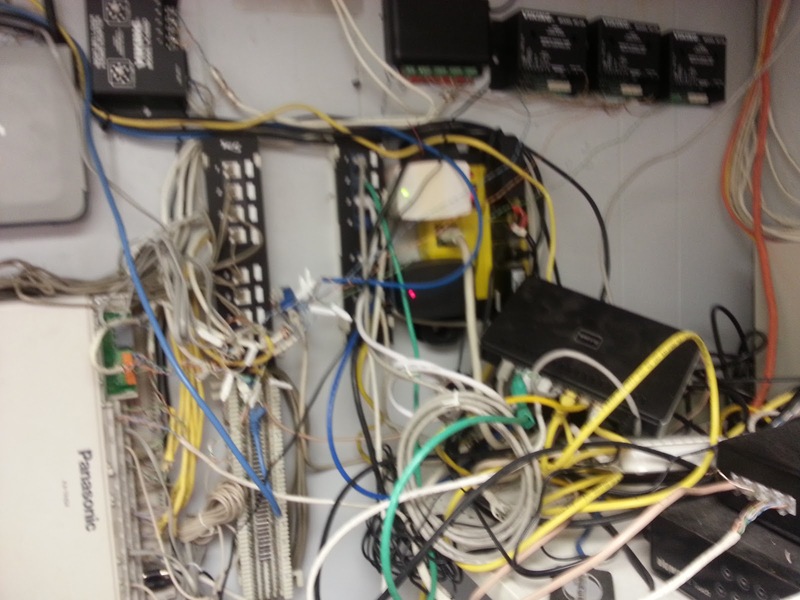 The Panasonic phone system was removed from a customers location when their network was updated, and they were discarding it. Still have not had a chance to punch down the jack ends of the network, but I got the HID end of things set up over the past weekend. 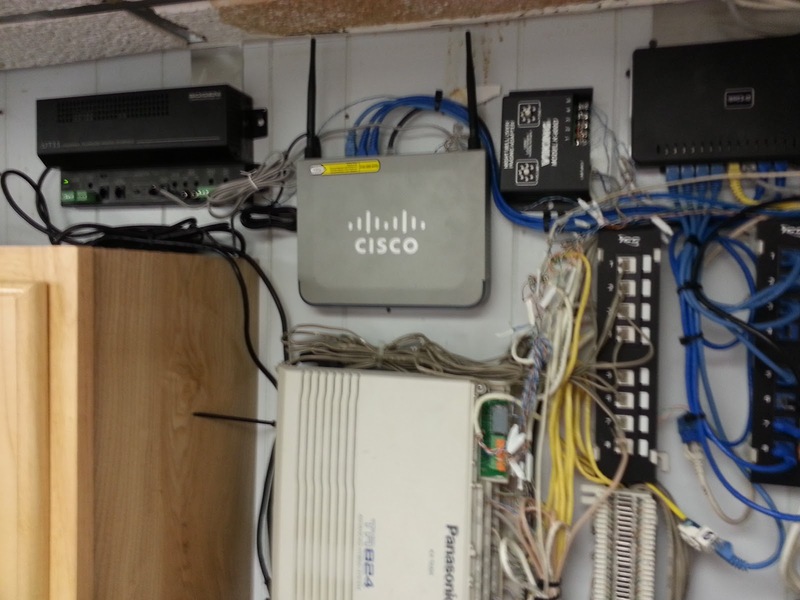 Network clean-up, Overhead paging, and door phone installation. Sometimes the simple jobs are the most complicated. This customer recently had another tech from our company come out and install the VoIP phones for the customer, but the customer required 3 door phones and an overhead paging set up. When I first arrived, I did what I had to and got the door phones and relays set up, so that the customer could begin using our VoIP service to answer the door phones and buzz people into the office doors. Prior to doing this I had to replace the router. This took about 2 1/2 hours. It should have taken much less time to accomplish this since they had existing door phones and wiring, but their network was in complete disarray when I first arrived. 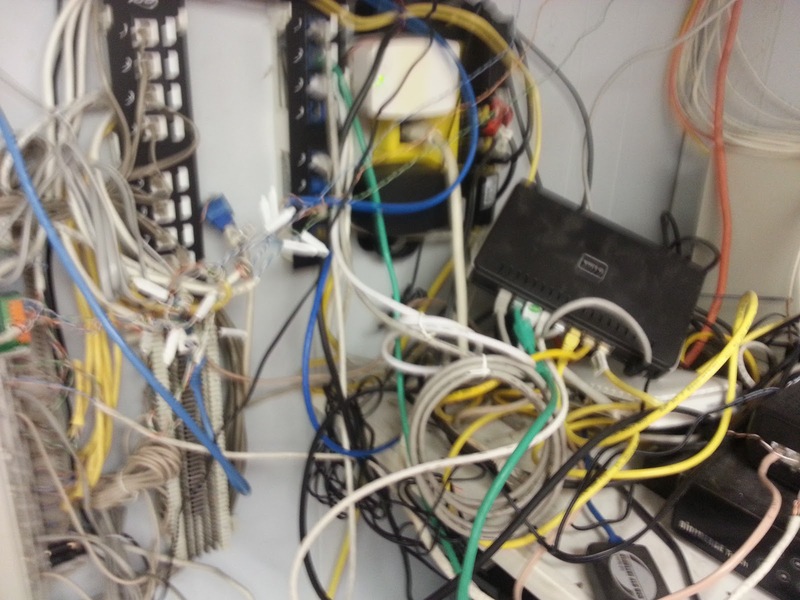 From previous experiences, I no longer work on or leave networks in this condition, especially for new customers. So the entire network was cleaned up. 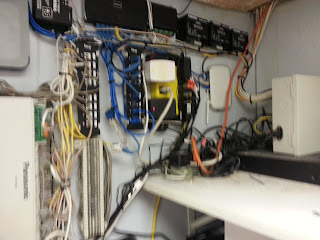 Switches, and other equipment that was just sitting on a shelf with wires all bunched up were all wall mounted, and the wiring was neatened up as much as is possible with a live network during business hours. I am, as always, not 100% satisfied with the final product compared to how I would have designed it had I done it from scratch, however it impressed the customer enough to provide a gratuity, which is always appreciated, and I feel it is as neat as possible giving the circumstances. Unfortunately my "before" photos were not taken until after I had already mounted the new router and 3 door phone relays, however almost everything else has so far been untouched in my "before" images. 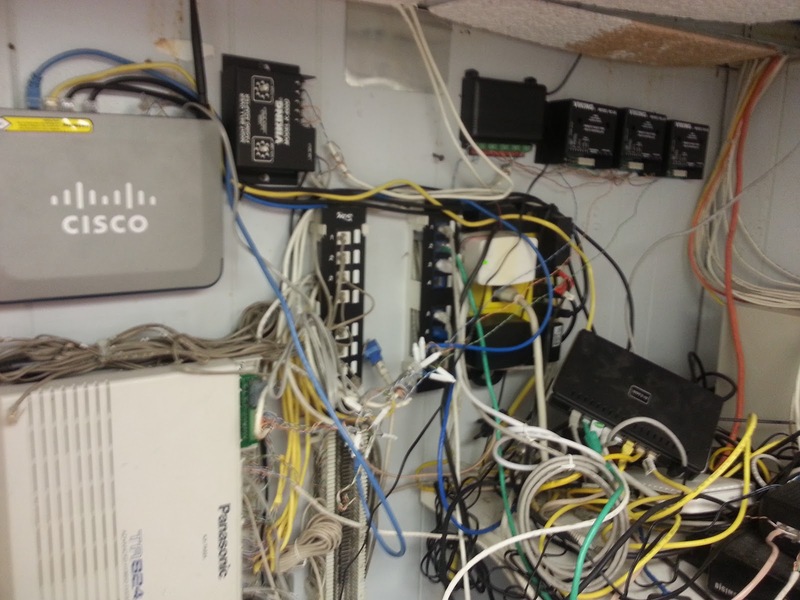 Switches and routers sitting on shelf, patch cords a complete mess! A wide angle of the mess that I had to work with. were installed to me prior to taking these "before images"
everything else was as found on arrival. DVR was pushed further back onto shelf, leaving some usable space. Power cords and DVR power supply were the only things left untouched and unmounted. Double 12 port panel install, with wire wall channeled to get around cross beam. 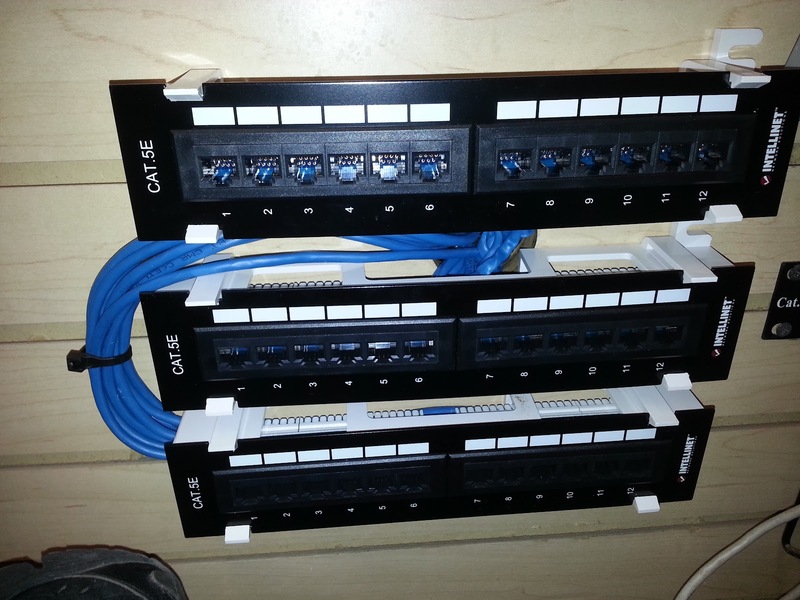 A recent 18 wire install, with two 12 port patch panels. 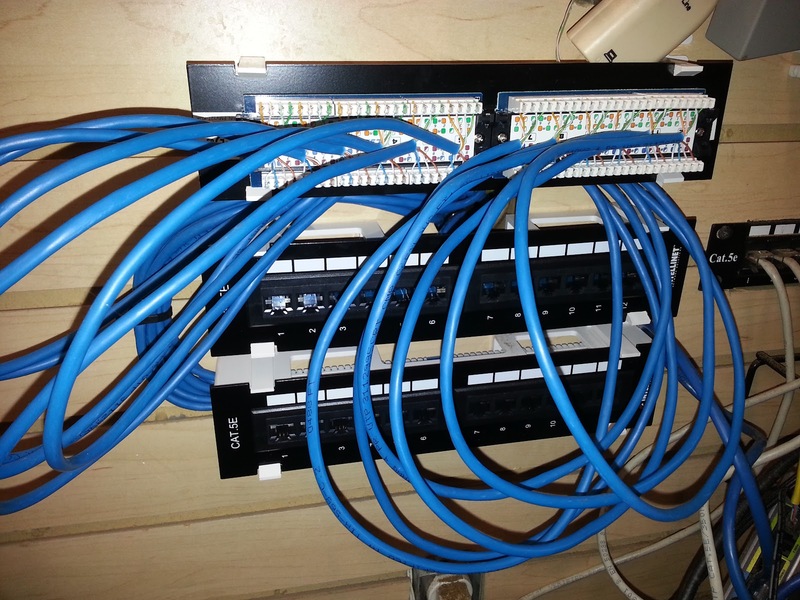 This customer has 9 jack locations with two CAT5 runs at each jack location. Top and bottom jack numbers match, the top jacks terminate to the left 12 port panel, while the bottom jacks terminate to the right panel. Due to the size of the office, the runs were very easy and quick to install. This install took about 4 1/2 to 5 hours to complete, including testing and labeling of all jacks. There was only 2 minor issues involved in this install. One issue was that one of the walls that had to be snaked down had cross beams. The wall was channeled, as shown in the below images below, to get around that cross beam. The second issue was that one of the walls where one of the jacks is going to is a corner with 2 concrete walls, so there is no means to snake down that wall. That wire will need to be put into wire molding on a future visit when the router and switches are installed. 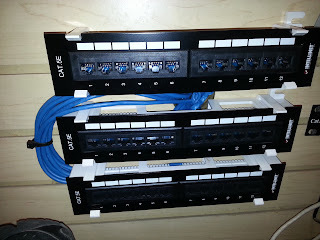 Two 12 port patch panels. The left panel is for the top jacks. The right panel is for the bottom jacks. Top and bottom jacks have matching numbers. 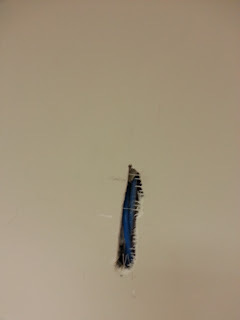 The wire run that had a cross beam inside the wall. A close up of the channel required to bypass the cross beam. One of our customers moved into a new location. 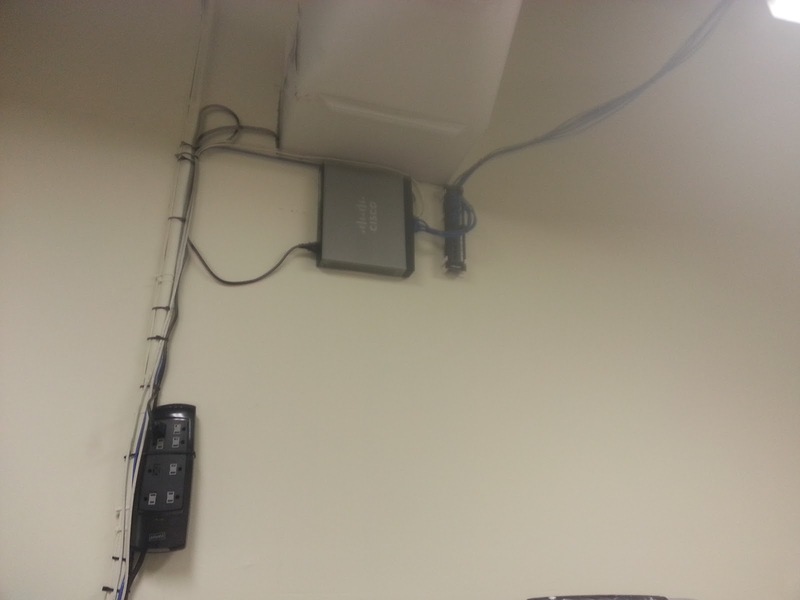 They had existing CAT5 wiring and jacks in place, however the wiring went in a conduit going to the floor above which they have no access to. The previous tenant of this office space apparently had office space on multiple floors or offices within the building, and their network room was located elsewhere in the building. Since there was a centralized location where all of the wiring in their office came together, which happened to be fairly closely to where the cable company installed their cable modem, the wires for the jacks that are going to be used by this customer were cut out, and punched down into a small 12 port patch panel. This is where the router and patch panel were placed, high up on the ceiling. 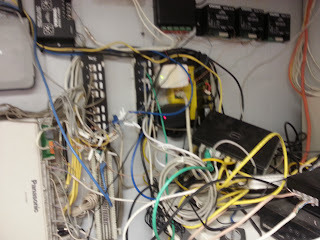 The black box on the left is a surge protector to connect power to the router. A close up of the newly mounted router, and new 12 port patch panel.